So you have thought about how you want to carry your hand gun around and you have a pretty good idea what the holster you are looking for has to offer. You want to have your gun concealed and at the same time be able to draw it as quickly as possible when the time arises. The holster that will do exactly that is the Inside-the-Pants Holster. The Inside-the-Pants Holster allows you to freely go about your day without attracting any unwanted attention while being prepared for any scenario. Great for detectives and personal security guards. What makes these holsters top notch though, is that because the hand gun rests between your body and belt, that drag is less and it sits more comfortable on you than a standard belt holster. The Inside-the-Pants Holster takes your average belt holster and touches it up a bit with concealment, protection and comfort. Any shirt that’s longer than your waist line will pretty much make it almost impossible to notice you are carrying. Because the hand gun rests between your body and your pants, it is more stable and more protected than a hand gun on a belt holster. For the same reason, the carrier will notice a greater comfort level while carrying throughout the day. It can be concealed easily. It offers the ability to draw quickly. It sits on the belt or pants and gives easy access to the hand gun. It is stable while running. It is protected from those around you. GrabAGun offers a wide variety of Inside-the-Pants Holsters, filling the need of anyone looking to buy. 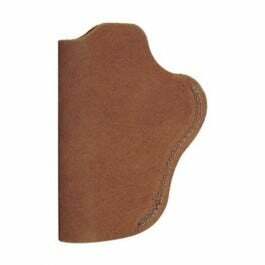 It doesn’t matter if you are looking for a simple and compact leather holster or a larger more complex suppression series.